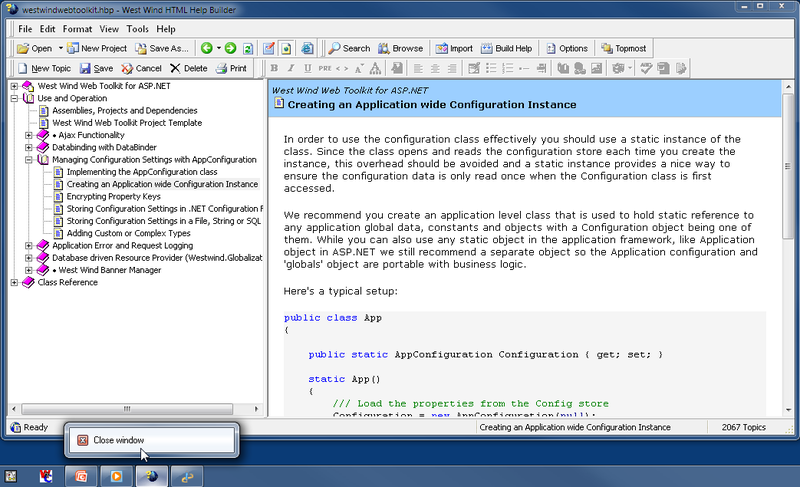 Ok, so I have one of my applications (Html Help Builder) that will not pin to the taskbar in Windows 7. This is an application I’ve created and have full control over in terms of build, but I can’t figure out why it will not pin to the Windows 7 taskbar. All other applications pin just fine, but this particular one will not pin or be dragged onto the taskbar. 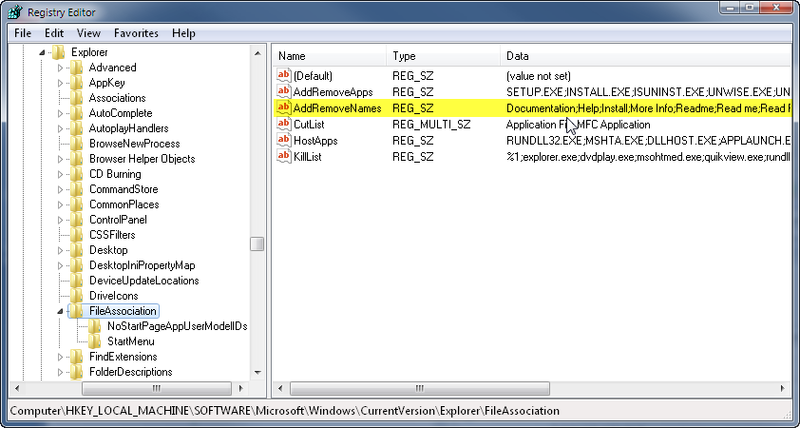 Not from a running application, not from a dragged shortcut or by using the context menu to pin it to the taskbar. The Task menu that pops up has nothing more than a Close this Application on it instead of the usual pin options. I also have this application hooked to a shortcut on the desktop and the desktop shortcut also doesn’t have a Pin to taskbar option like all other icons. As far as I know there’s nothing particularly special about this application. It’s an EXE launched from either a shortcut or directly from Explorer and it just will not pin. Since this is a distributed application I also installed it on another machine with exactly the same result. The context menu has no pinning options and I can drag the shortcut onto the taskbar either. This is an old FoxPro based application that uses the Visual FoxPro 9.0sp2 runtimes. Now some of you will jump on that and say “Aha!” – but that’s not it. I have several other applications that are configured pretty much in the same way – and they run fine and have perfectly fine pinning options. In fact the second screen shot you see is another FoxPro EXE application run off a shortcut. And it appears to be working just fine. So it appears it’s something inside the application that is causing this to occur. So imagine that prior to this section I posted about 10 bullets of things I’d tried that didn’t work to solicit some feedback, when I ran across a Technet post with another guy who had an application named documentation.exe that didn’t work. It was explained to him that there are a few ‘reserved’ words for EXE names that are treated special. documenation.exe was a bad name – and bad names don’t get proper taskbar representation. Bad exe – go stand in the corner! Windows has a few reserved names that include things like Documentation, Help, Setup, Readme etc. that are not pinned to the taskbar. These are exceptions in Windows (sorry, I couldn’t find a link that provides a complete list). I dismissed that Technet post initially when I ran into it because the name of my EXE is pretty unique: wwhelp.exe. Not exactly a name you would expect to be on any sort of exception list. But it turns out the rules in Windows aren’t exact matches, but it looks for anything that contains these names. So anything that contains the word Help in the EXE name is considered a special item (presumably a help file). So I renamed my file to HlpBuilder.exe and lo and behold – I get my Pin to taskbar back and all windows show up on the task context menu. It gets even better though. If I rename the EXE I do get the Pin to taskbar option, but if I create a shortcut and name it West Wind Html Html Help Builder the shortcut again has no Pin to taskbar option and I can’t drag it to the taskbar. Apparently if the reserved word appears in the text of the shortcut it too is limited in functionality. Where is this Limitation coming from? Man, how retarded is that? If an EXE file contains any of these reserved words it won’t pin? If the Shortcut Text contains one of these reserved words it won’t pin and generally work incorrectly? Really? Why have an arbitrary exception like that? That’s making an awful lot of assumptions and this is likely to break a number of application and they’re standard Windows behavior. This is an EPIC design failure on Microsoft’s part. It looks like my only alternative is to rename the main EXE. I’m not really married to wwhelp.exe (how old skool of me – uh, this app is going on 15 years)Unfortunately it’s not quite as simple as that. There are update routines in a separate application that have the filename hard coded (and which doesn’t update at customers) and since the EXE is a COM server it needs to be re-registered. An EXE change basically requires a full reinstallation of the product instead of the normal update process I use. But I don’t know what to do about the shortcut. I can’t just erase Help from the name of the shortcut since it’s the freaking product brand name. So as a vendor what do I do? Hack the registry during installation and modify that string, remove Help from the list? That’s evil mucking with user settings, but what other options are there? <sigh> It’s never easy on the Windows platform is it? How I hate building desktop apps these days, but this is one app that wouldn’t work well as a Web UI unfortunately. that holds the values that can't be contained in the EXE or the shortcut name. Thanks Rick, I wondered why i couldnt pin the telerik controls help file to my taskbar. i had to create my own 'quick launch like' toolbar folder and add it to that. I am betting these keywords are getting used so these common install things that get unessisarily shoved in to the startup menu don't show up in the frequent used list in the start menu. Although I see no reason why they shouldn't be allowed to be pinned, unless Microsoft wanted to make sure that no vendor auto pinned these things to the users start menu. So, any idea which this registry key exists in Windows XP as well? I'd love to back up then remove the values in that key, but if it has some REAL use other than preventing productivity, I'll have to hesitate. Can you modify the AddRemoveNames key and remove the "word help", pin your app, then restore the key? If your app stays pinned after restoring the key, then you have an ugly hak that will let you pin your app. You can provide a "pin" option at install time. After install, you woul ahve to add a "Hack" menu with a menu option called "Disable brain-dead Windows anti-pinning technology" that lets you rename that key. You would want to have a dll to de-lobotomize so you can do the force elevation thing. There's another tricky taskbar bug I have not been able to figure out. I store my imporant information on a NAS device, and I don't map it to a network drive. I just use the full UNC path, such as \\nasdevice\share1\files\etc. I initially pinned several separate shortcuts to the windows explorer jump list, \\nas\docs, \\nas\setups, etc. After a while, those shortcuts change. They'll all change to the same thing, like \\nas\someshare. And you can't remove them from the jump list, no matter how many times you hit unpin. I know it has something to do with the locations becoming unavailable at some point (I reset my router, the NAS goes to sleep after 20 minutes of no access, etc), but it's a pain that I have 6 or 7 shortcuts to the SAME location on my NAS, and I can't change or remove any of them. Another epic fail. @Nick - I don't buy that argument. It's easy enough to hack this so if a malicious app wants to install the shortcur anyway it's pretty easy to do. Pinning if I understand it right is a user action that the user initates explicitly - not an installation issue. So while it maybe that this list is used for other things I think this restriction list is totally inappropriate. Also in searching for a solution on this there were TONS of questions regarding pinning folder, networks shares (Sam's example being one of them) and that doesn't work easily either. This also seems a pretty severe oversight. The new taskbar is nice and definitely an improvement, but this particular 'design feature' seems counter productive to the usefulness of the new taskbar. Everything should work on it especially if it's user initiated. It would be useful if those who designed this spoke up. Why oh why? Failing that it looks like we need a change in a Service Pack. It looks like this was initially intended to prevent "noise" applications from appearing in the frequently used programs list for XP. "There are update routines in a separate application that have the filename hard coded (and which doesn’t update at customers) and since the EXE is a COM server it needs to be re-registered. An EXE change basically requires a full reinstallation of the product instead of the normal update process I use." Come one now, I'm kidding. Geesh! Thanks for the post, that was driving me crazy with some of my favorite apps. @Nathan - no kidding. It's a really old app and it works well for its designated business task, but it's susceptible to Microsoft tweaking the OS. I've thought about updating this app for years, but there's monumental effort involved in making this happen for not much of functional gain. The main improvement would be more consistent UI and well probably better overall design, but still on the grand scale of things that's minor improvements for the amount of effort that would be involved to replace existing functionality. PLUS - even with .NET I'd be stuck with COM Interop for HTML Editing interfacing with the Help engine and also with FoxPro (for imports of Fox classes/data etc.). Can't get away from a lot of this in practical environments :-}. @Richard - thanks for the links. So it looks like this is something that's been with us for a while but applied to the task bar. I guess that explains some other problems I've had in the past with this app not showing up in the MRU list. Crap. The MRU list is a passable problem but the taskbar shortcuts? It makes no sense that the same rules are applied to that because you can only get things onto the taskbar voluntarily. Thanks for the post Rick, helped me track down a similar issue. I also found that creating a shortcut to the original file and naming the shortcut something that doesn't have one of the reserved words does the trick as well. Gents, I ran into a problem with not being able to pin a file to the taskbar, but your renaming trick didn't work. It's GnuCash.... It won't pin to the taskbar to save my life, neither will any shortcut to it, named anything I can think of. For some reason draggin "Run" to my superbar did nothing. I had to start the program and then rightclick the task to pin it. I allways have Run on my taskbar on earlier windows'. Thank you all, but this name-thing does not work! I have some programs written in vb6: cashtime.exe, gserver.exe and console7.exe, neither of them can be pinned. Why? I think I can answer my own questions. Cashtime.exe is on a mapped network drive, the others are on a removable volume. Probably MS allows pinning only from the local HDD. Thank you for sharing this info....your blog is the only place that has the solution as to why I couldn't pin my application to the task bar. I had the problem of pinning icons to the task bar also. There was not an option when I right clicked the icon to do this. I finally found the problem. It was the Google Chrome program.It worked after I removed the program. I would guess there are others that will do the same thing. Thanks for the post - I don't think I would have come up with that in a million years. Saved me a ton of aggravation! Cheers. Thank you very much. I search an entire evening, the reason for why I couldn't add to taskbar, a program who had the word uninstaller in his shortcut name. Now, i know why this happened, and problem was solved (renamed shortcut name). Keep up the good work. Wow thanks. This is a very helpful article! I have brand new windows 7. At home I can pin everything. Here at work I can't pin firefox! Nothing wrong on the file name, and I do have it pinned at home. Any idea what can be the problem? i got round not being able to pin Supportworks by using a Cyrillic o in the shortcut name, which solved the problem. then pin that to the taskbar. Now the shortcut should work. The only problem is that the shortcut isn't used to represent open windows, so when the program is run, it puts a separate copy of the shortcut in the taskbar. Anybody have ideas on how to fix that? Hi man i dont know why cant pin any program to taskbar but i clean and deleted my registry mybe this problem for it ? Yep, and just tonight I had to spend a considerable amount of time to figure out why my parents can no longer simply drag a Url from Internet Explorer to the taskbar to create a quick shortcut to that website like they were easily able to do and used to in Vista (and I think XP). 2) Now you have to go to that program's icon (in this case IE) on the taskbar and RIGHT-CLICK it to see your PINNED URLs. Again they're like wtf ? don't get me wrong, techies like the new taskbar and slick combinations but then again even use techies are having issues just like yours where things that nobody (techies nor basic users) would ever think you need a HACK for and which you CAN do in an Apple OS. As much as I'm anti-Apple that being OS specifically, I have to say I can drag the recycle bin to the taskbar without a freakin hack. I can do x,y,z which any user would expect to be able to do WITHOUT A HACK. I really do not believe that MS does true usability testing. In fact I can tell you even though they show videos of it, you can't tell me x,y,z did not come up because I see posts all over about x,y,z and to do those you have to HACK the registery, or know some f'd up work-around to do something so simplistic my grandma should be able to do it. As a techie, I applaud Windows 7. As an end user, I am actually very concerned that MS once again did not address or do any real usability testing or they ignored half of what their customers I would think would be telling them. The excuse for the new taskbar should not be "Well it's a new way to do it, it's better". Even if it is (to some) you should be able to do both things easily and those things that are commonly expected and were able to be performed on the taskbar...especially dragging all these files that everyone is now having trouble with even you. -Copy the .exe to your local drive. -Make a shortcut on your desktop. -Pin this shortcut to your taskbar. -Right-click the pinned item on the taskbar, then right-click the shortcut in the jump list. -Click Properties, and edit the Target and Start-in fields so they point to the network location. -Delete the .exe you copied locally and remove the shortcut you created on your desktop. You should now have a pinned shortcut on the taskbar to a network location. I find that I end up on your blog a lot, usually for ASP.NET stuff. I'm reconfiguring my WorkStation and ran into this today. Thanks for sharing, fixed my problem. Instead of renaming the executeable, I created a Shortcut and then renamed the shortcut. That way, my execute stays the same but the Shortcut is pinnable. Clearing mentioned registry key does not solve problems for some programs (on Windows 7 at least). It seems MS does not like some vendors at all (ex. Lotus Notes from IBM). But there is surprisingly easy solution - just drag and drop your shortcut to start menu. It works perfect for any program or even folder. Copy the .exe to your local drive. Dave! You are the winner! Works 100%. No registry hacks, no scripts to write, no duplicate icons on the task bar. Pins to both task bar and the task menu. Thanks. "Man, how retarded is that?" Spot on! I will never understand why people add retarded features to their software. I mean it's clearly an intentional feature, someone actually THOUGHT about it. That someone wasn't very good at thinking. Thanks, Rick. Had a program with the word "remover" in it and it would not pin to Taskbar. Kudos to Google and to your site! Thank you! I was having the same problem with a program called RemoteSupport. Support is a bad .exe name too. Two more ideas: The first worked for me, YMMV. I wanted to get Gnucash pinned to the start menu. It doesn't because it is not an .exe file but a .cmd. In the end old fashioned drag and drop worked, I dragged the shortcut from the depths of the start menu back over the start menu icon, and it worked. I saw a good suggestion elsewhere that ought to work, maybe even for the OP. instead of a shortcut to your program, make a shortcut to "cmd.exe /C +your prog.exe/cmd/bat) this is an .exe and looks like it ought to work. You post really helped me, too. I wanted to pin a "setup.exe" (it's actually cygwins setup) and I use it a lot to install/update the packages and thus wanted to have it available in the star menu. Hi, could it be because of mismatch between the exe that is executed and the name of the process running for that program. I have pinned Lotus Notes, but when started another icon comes up in the taskbar, so it's not "overlaying" the shortcut. When starting Lotus Notes, notes.exe is executed, but it's process is notes2.exe. I tried starting nlnotes.exe instead (Notes Classic) and it's process is named nlnotes.exe and then it worked. The pinned program (shortcut) was overlayed by the running program. You could also make a shortcut in the app's root folder, then change its name, and pin that to your task bar/start menu. Thanks - this has bugged me for ages! Our in-house support application is called "Support", and wouldn't pin. I've simply renamed the desktop shortcut to "Spprt" then pinned it to the task bar. My problem was removable drive but I had lots of pinned things from removable drives. The trick is you can copy the EXE to your HD, then pin the local one, then go modify the pinned shortcut to point to the removable drive. Started me thinking about what else was wrong. And now I am just seeing the post about removable drives. I could not get putty to pin because of where I had the exe file located. Just ridiculous. I can just imagine the MS nerds mapping out the design for this one. Hmm - just too easy if we just continue to let the user drag an icon to the task bar. Well, soon I will be able to reboot this box into its native sensible mac-ness and then I can get some real work done. Thanks for the post, even though it wasn't the post it self that solved my challenge but some of the comments that sent me in the right direction. cheers to all of you. I have a problem where the applications show up in the folder for the toolbar they just dont show up on the toolbar. so i can pin them. i can see them in the folder. they dont show up at all. i tried uninstalling the latest batch of updates didnt work. tried the 2 other fixes commonly out there the regedit islink file and the gums.msc or however it goes. nothing works atm. Thank you very much! I was spinning my wheels trying to figure out why I couldn't get two shortcuts to pin. They have "help" in the name Stupid Windows! I had problems trying to pin the VPN software I have to use to connect to a client's network (at least once a day when I work from home). Couldn't get it to work no matter what I tried. Finally tried googling it, and ran across this post. Mine was different though, and nothing suggested here helped. Looking closer at it, I noticed that the shortcut listed "Network Connections" as the "Target location". So I opened up "Control Panel / Network and Internet / Network Connections", and dragged the icon for the VPN software from there to the start menu. This time, it worked. Even though this post didn't directly help, it did get me looking deeper into my problem, so indirectly it did help. I wanted to post this to (1) say thanks, and (2) in case someone else was running into the same problem. re: Bill Dixon VPN not resolving with any of above... having same issue. Mine couldn't even be fixed by going to network connections (where the target was pointing) and trying to pin that one. Frustrating. Same program pinned in XP. Somebody above said chrome was an issue... which I have installed. I may try that next. A work around for me was to leave the exe file name the same, but manually create a shortcut in "C:\ProgramData\Microsoft\Windows\Start Menu\Programs" (or appropriate sub folder, if necessary). Have the shortcut point to the exe, but modify the shortcut name to not include the reserved word. Worked on 32bit and 64bit systems. Man it is all in the name! Thanks much man this was confusing me fo sho! I had the same problem but it wasn't the name that was the cause. Rather it was the location. I have a small USB flash drive that I keep plugged into my computer at work on which I keep my music and a portable chat program along with its data files. I was unable to pin the chat icon to the taskbar. I finally realized that if I make a copy of the EXE on the C drive and create the shortcut using that copy then I can pin it to the taskbar. After pinning, I edited the properties of the taskbar icon to point to the USB location and removed the temporary files from the C drive. VB.NET app pins fine on my personal desktop but not on a server (Citrix pointing to Windows Server 2008). Name didn't matter (in my case, the name was DriveMapper). I read above someone had a problem with pinning from a network drive and that was EXACTLY my issue. When I put it on a local drive (like the server desktop), it could pin fine. So no pinning for that app from a network drive. Thanks for helping solve the mystery. Now I can move on.